Amazing Spaces: Meet our Fuse Dorm Contest Winners! 12/6/2010Share this story on Facebook! 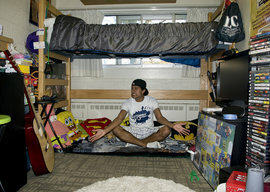 Funniest Room winner Sheraz Iqbal '12 made sure his dorm is an entertaining place to hang out, with comfy seating and a totally chill atmosphere. Shop at second-hand stores to find vintage posters, framed pictures, and unique decorations that are both one-of-a-kind and super cheap. Shop on the off-season, August means a mad dash of college shopping so look for sales on things like comforters and sheets when it isn’t peak dorm-shopping season. Swap with your friends. Get a group together to trade decorating items that you don’t use anymore. You can get rid of your old stuff and get new decor for free! Think ahead. You are going to buy a lot of new things for your dorm so make sure you love them. If you shop smart that desk lamp or decorative rug could last you your four years at IC, and beyond. For many students this is the first time living with a roommate, and it is essential to collaborate and discuss ways of maximizing space. Communicating with your roommate before you arrive at IC will ensure you don’t show up with doubles. 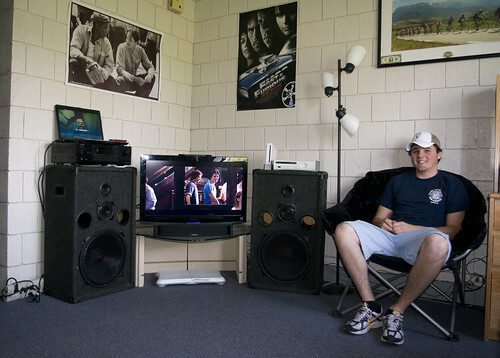 (Two mini fridges may sound awesome, but your dorm room isn’t a mansion.) Want more floor space? A college maintenance team will be happy to assist with lofting or bunking beds and you are free to rearrange the furniture however you like. Fuse dorm contest champions Kathryn Krick ’13 and Julianne Feller ’13 got creative with their Tallcott Hall double when they painted a wall pink. Believe it or not, it’s okay with the Office of Residential Life if you want to paint your room! All you have to do is contact Res Life about approved colors and then paint away. A pet fish is a great way to add some life to your dorm space, and it makes a great conversation piece. The best part? The Office of Residential Life allows them! Sorry, dog and cat lovers, you’re out of luck while you live in the dorms. If you move to a campus apartment (and if you have the time and dedication), you may want to consider training a Guiding Eyes Dog, which is allowed on campus. Before you dive into decorating, decide what you want the feel of your room to be. Is it a quiet study room? Is it the spot where everyone comes to play video games and watch movies? Do you have a welcoming, open-door policy? Discuss these factors with your roommate and base your room around that ideal. You might want to choose soft colors and optimal lighting for a study room, while a proper hangout room should be equipped with snacks, entertainment consoles, and plenty of chairs and pillows. Whatever you decide, consider your room your canvas and take the time to make it a masterpiece.